America does not concern itself now with Impressionism. We own no involved philosophy. The psyche of the land is to be found in its movement. It is to be felt as a dramatic force of energy and vitality. We move; we do not stand still. We have not yet arrived at the stock-taking stage. There is a vitality, a life force, an energy, a quickening, that is translated through you into action, and because there is only one of you in all time, this expression is unique. Think of the magic of that foot, comparatively small, upon which your whole weight rests. It's a miracle, and the dance is a celebration of that miracle. You see, when weaving a blanket, an Indian woman leaves a flaw in the weaving of that blanket to let the soul out. 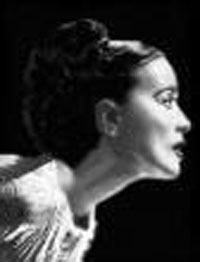 Martha Graham was born in 1894 in a small city outside of Pittsburgh, Pennsylvania. Her father was an "alienist," the term then used to describe a physician who specialized in human psychology. Dr. Graham was particularly interested in the way people used their bodies, an interest that he passed on to his eldest daughter. In later years, Martha Graham often repeated her father's dictum: "movement never lies." In 1908, the Graham family moved to Santa Barbara, California. Graham finished her secondary schooling, attended a school of dramatics for three years, and then in 1916 began studying at Denishawn. During the next seven years, Graham evolved from a student, to a teacher, to one of the company's best-known performers. She often worked as Ted Shawn's partner, and became the co-star of "Xochtil," his famous duet about an Indian girl and an Aztec emperor. Graham left Denishawn in 1923 to take a job with the Greenwich Village Follies, where she gained a reputation for her ballet balleds. In the next three years, she became a part of the Greenwich Village art scene, and saw the work of Eleanora Duse, the Moscow Art Theatre, and Max Reinhardt. In 1925 she left the Follies to begin an independent career. In order to support herself during this period, she took teaching positions at the Eastman School of Music in Rochester, NY and the John Murray Anderson School in NYC. On April 18, 1926, her company, featuring students from Eastman, debuted in New York City. The program was heavily derived from the Denishawn repertory, featuring Graham in exotic solos and her students in a ballet ballad called "The Flute Of Krishna." A review from The Dance, described Graham as "clad in a heavy gold kimona, making patterns with her body against a screen of brilliant lacquer...Martha Graham presents a series of pictures that fire the imagination and make a hundred stories for every gesture. Shall we say her dances are motion pictures for the sophisticated." By 1927, Graham had resigned from the faculties of the Eastman and Anderson schools and was working full-time as a dancer and choreographer in New York City. She soon began working with Louis Horst, whom she knew from Denishawn, where he had been the musical director and resident accompaniest. Horst was a major figure in the modern dance scene of the 1920s, 30s and 40s. For a period of time in the 1930s, he was the accompaniest for almost all of the leading dancers in New York City. But his closest association was with Martha Graham, whose artistic vision he remained devoted to throughout his lifetime. Horst introduced Graham to the work of the great German modern dancer, Mary Wigman, and to the innovations of the school of modern painting, including the works of the Cubists and Wassily Kandinsky. But perhaps most importantly, Horst taught Graham about musical form and encouraged her to work with contemporary composers rather than making dances to eighteenth and nineteenth-century music, as her solo dance predecessors had done. Though the dances Graham created in the late 1920s were derivative of Denishawn pieces, by 1930 she was beginning to identify a new system of movement and new principles of choreography. Based on her own interpretation of the Delsartean principle of tension and relaxation, Graham identified a method of breathing and impulse control she called "contraction and release." For her, movement originated in the tension of a contracted muscle, and continued in the flow of energy released from the body as the muscle relaxed. This method of muscle control gave Graham's dances and dancers a hard, angular look, one that was very unfamiliar to dance audiences used to the smooth, lyrical bodily motions of Isadora Duncan and Ruth St. Denis. In her first reviews, as a result, Graham was often accused of dancing in an "ugly" way. But critics and audiences soon became accustomed to Graham's innovative style of movement and she developed a following among serious dance patrons, scholars and critics. During the early 1930s, her work was focused on emotional themes. Her famous solo, "Lamentation," for example, was a portrait of a grieving women, sitting alone on a bench and moving to an anguished Kodaly piano score. The scholar Elizabeth Kendall has written that "Lamentation (image)" is both a piece about the emotion of grief and a visual homage to contemporary architecture, most notably the new skyscrapers that were beginning to fill the New York skyline. She describes Graham's figure in the dance as "a skyscraper reeling," making a connection between the two impulses of Graham's aesthetic vision. Graham's "Primitive Mysteries"
After a trip to the American Southwest in 1931, Graham became interested in making dances on the theme of American history. In "Primitive Mysteries," the choreographer combined her interest in the religious rites of American Indians with an exporation of other religious rites, including pagan and Catholic ceremonies. In this 1931 work, Graham danced the priestess figure called the Virgin, and her ensemble become the society of independent women who surround her and worship her. "Primitive Mysteries" represents a number of important advances for Graham. First, the choreographic focus is firmly on the corps of dancers rather than on the solo figure, pointing to a fundamental shift in the way Graham was approaching the architecture of dance. Second, the narrative of the dance is not presented in a literal way, but uses only a pure, abstract movement vocabulary to bring its story to life. And finally, "Primitive Mysteries" was Graham's first critical masterpiece, garnering attention from critics, artists and audiences around the world. The apotheoses of Graham's "American period" were the creations of the solo piece "Frontier" in 1935 and the seminal dance/theatre work, "Appalachian Spring," a decade later in 1944. In both pieces, Graham used a simple set designed by the sculptor Isamu Noguchi to help evoke the frontier landscape, and her own unique movement vocabulary to flesh out the soul of the pioneer women at the heart of each dance. The footage of "Appalachian Spring" clearly illustrates how Graham adapted her percussive, angular movement style to fit the period setting of the piece. Martha Graham died in 1991, after a career that lasted 75 years and produced some of the greatest masterpieces of the American modern dance. The Martha Graham Dance Company is still a vital force and can be seen in residence in New York City and on tour. Since this tutorial is designed to cover the origins of the modern dance and its first decade, the rest of Martha Graham's story will not be told here. We encourage you to turn to the reference and bibliography sections of the tutorial for guidance about further reading. Graham's movement system and her theory of contraction and release are central to the development of modern dance in the United States. 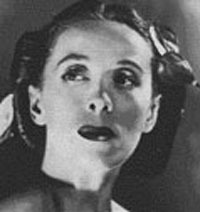 Graham was the first modern dance choreographer to fully use collaborations with other modern artists to create her dance theatre masterpieces. Her collaboration with Isamu Noguchi and Aaron Copland in "Appalachian Spring," for example, remains one of the dance's great masterpieces. 1894: birth in Pittsburgh (Pennsylvania) on May 11, her father was a doctor. My childhood years were a balance of dark and light. 1908: her family moved to Santa Barbara (California). 1911: she saw a performance of Ruth Saint-Denis and decided to become a dancer. I went to the theatre, the Mason Opera House, with a dark dress and a hat my father had bought for me.(...) He pinned a corsage of violets to my gray dress and that night my fate was sealed. The curtain parted. The audience was still. Miss Ruth was doing a program that included her famous solos -"The Cobras", "Radha", and "Nautch". Also on the program was her famous dance "Egypta". 1913-1920: she studied theater and dance at the University of Cumnoch (and graduated in 1916). 1916: she joined the Denishawn School in Los Angeles (school of Ruth Saint-Denis and Ted Shawn). There she danced several important roles, including Shawn's Xochtil (1920), and met the composer Louis Horst. 1923: she left the Denishawn (with Horst). 1926: she taught at the Eastman School of Rochester. she gave her first recital in New-York (48th Street Theatre) on April 18, with Betty McDonald, Evelyn Subier and Thelma Braerce. It included 18 short pieces (musics of Scriabine, Debussy, Satie, Ravel and Horst). The first concert was held at the 48th Street Theatre on April 18, 1926. I danced solos to the ;usic of Schumann, Debussy, Ravel, and others. Louis Horst was my accompanist. (...) I did many dances, and everything I did was influenced by Denishawn. There was an audience. They came because I was such a curiosity- a woman who could do her own work. 1929: her first non-solo ballet, Heretic. 1930s: because of the economic crisis, her ballets had no sets, and she made most of the costumes herself. 1936: she refused to go the Olympic Games in Berlin. "I would find it impossible to dance in Germany at the present time. So many artists whom I respect and admire have been persecutes, have been deprived of the right to work for ridiculous and unsatisfactory reasons, that I should consider it impossible to identify myself, by accepting the invitation, with the regime that has made such things possible.(...)" 1938: She was invited by Mrs Roosevelt at the White House, and created American Document (dealing with American Independence and Abraham Lincoln). In 1937, I danced at the White House for the first time for President amd Mrs. Roosevelt; I would dance there for seven other presidents. I danced in a little garden that was filled with flowers. 1939: Merce Cunningham and Erick Hawkins (who was to become her husband) joined her company. 1940s: her company toured in the USA and in Cuba. She created El Penitente and Letter to the World at the Bennington Festival, and also Appalachian Spring (1944), which was her first collaboration with the set designer Isamu Noguchi. 1948: she got married with Erick Hawkins. Erik danced with my company, and gradually we had a very deep love affair. After eight years of living together, Erik decided we should marry. I didn't want to but I did. During that ninth year it all fell apart. It shows. Never try to hold on anything. 1955: Paul Taylor entered her company (as a dancer). 1956: she won the Dance Magazine Award. 1959: she created Episodes with Balanchine, (ballet danced by her company and the New-York City Ballet). Mr Balanchine was wonderful to work with, considerate and concerned- a joy to be with. around 1970: she stopped dancing. Then she had to face some very hard years of depression and health problems, before creating new ballets again. A dancer, more than any other human being, dies two deaths: the first, the physical when the powerfully trained body will no longer respond as you would wish. After all, I choreographed for myself. I never choreographed what I could not do. I changed steps in Medea and other ballets to accomodate the change. But I knew. And it haunted me. I only wanted to dance. Without dancing, I wished to die. The last time I danced was in Cortege of Eagles. I was seventy-six years old. (...) I did not plan to stop dancing that night. It was a painful decision I knew I had to make. 1973: She created Lucifer and The Scarlet Letter for Rudolf Nureyev and Margpot Fonteyn. Many people have asked me why I did Lucifer with Rudolf Nureyev. Lucifer is the bringer of light. When he fell from grace he mocked Gosh. He became half god, half man. As half man, he knew men's fears, anguish, and challenges. He became the god of light. Any artist is the bringer of light. That's why I did with Nureyev. He's a god of light. And Margot Fonteyn was such a glorious complement to him at it. Luminous as night. When I first saw Margot Fonteyn she was a great and beautiful figure. The magic of Margot's presence is an elusiveness of spirit that defies description. 1984: Her company was invited by Rudolf Nureyev at the Paris Opera, and she was given the Légion d'Honneur by the French government. In 1980. a well-meaning fundraiser came to see me and said, "Miss Graham, the most powerful thing you have going for you to raise money is your respectability." I wanted to spit. Respectable! Show me any artist who wants to be respectable. 1991: death on April 1. She was working on a new ballet for the Olympic Games of Barcelona, called The Eye of the Goddess. I'm asked so often at ninety-six whether I believe in life after death. I do believe in the sanctity of life, the continuity of life and of energy. I know the anonimity of death has no appeal for me. It is the now that I must face and want to face. Martha Graham changed modern dance. She did not invent it, but she did refine it and define it. Her style was that of abrupt, harsh movements, and complex floor work that others neglected. It was a stark style, but one that today serves as the basis for teaching modern dance, and made her the "Mother of American dance." 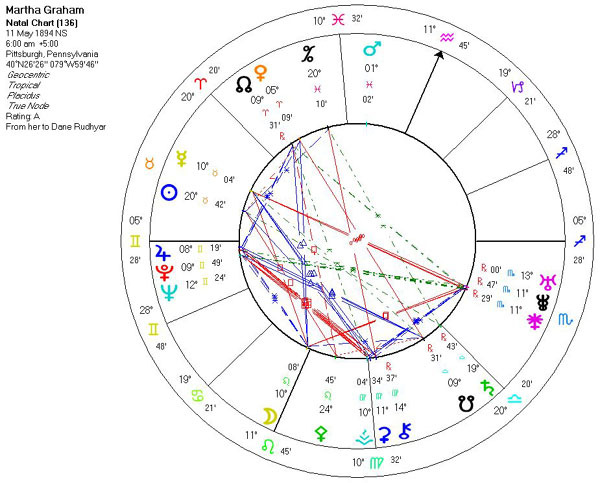 Graham was born May 11, 1894 in Pittsburgh. Her father was a doctor in that city. Her family moved to Santa Barbara, CA, in 1908, and in 1911 she saw a performance of Ruth Saint-Denis that inspired her so much she decided to become a dancer. She later would study at Saint-Denis' dance school, Denishawn, which she ran with her husband, Ted Shawn. In 1926, she took a teaching job at the Eastman School of Music in Rochester, NY, and gave her first recital at the 48th Street Theatre in New York City. 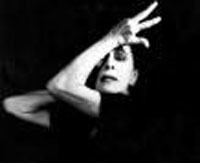 In 1927, she opened her own school, the Martha Graham School of Contemporary Dance. Her fame and reputation grew. In 1936, Graham established the school of modern dance at Bennington College. She was invited to perform at the 1936 Olympics in Berlin, but declined because of the German persecution that she had become aware of. In 1937, she gave her first performance at the White House for the Roosevelts. She would also dance for seven other presidents. She married Erick Hawkins, a dancer in her company, in 1948, but the marriage didn't last long. Her most notable and probably longest lasting work was Appalachian Spring, which she choreographed in 1944. Graham didn't stop dancing until 1970, when she was 76 years old. She received the Presidential Medal of Freedom in 1976, and in 1984 she was awarded the Legion of Honor by the French government. She continued writing ballets until her death on April 1, 1991.